The new revolutionary environmentally safe protective barrier for retarding the transfer of heat. This product will adhere to vertical non-absorbent surfaces as well as to stones. You will no longer have to remove the stone. 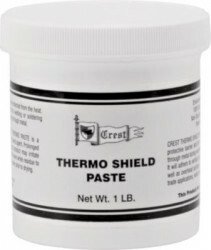 Dab the Thermo Shield on the area you would like to protect and hit it with the flame. No heat will transfer. Absorbs temperatures up to 3 000¡F. Water soluble.